Human Rights Activists News Agency (HRANA)- A prayer answered, a vow fulfilled — such is the faith behind the Nadhri (or Nazri) charity meal, a faith that’s now left many a Rajai Shahr prisoner burned. Rajai Shahr Prisoner Director Gholamreza Ziaei capitalized recently on this mourning rite for the late Imam Hussein when he engaged, in exchange for individual prisoner donations of 2-3 million tomans [approximately $150-$200 USD], to undertake preparation and distribution of the Nazri meal. Prisoners looking forward to tasting red meat again for the first time in months or years were disappointed on October 31st (i.e. Arba’een, last day of the mourning period) by a Nazri “feast” of yet another watery and meatless stew made from the prison pantry’s bottom-shelf usuals. Ziaei reportedly collected a total of 70 million tomans [approximately $4,700] from prisoners for the meal. An informed source estimated the cost of the Rajai Shahr Nazri service at 20 million tomans [approximately $1,300]. Prior to Ziaei taking the helm of Rajai Shahr, prisoners were permitted to buy food from the prison store and share meals at their own expense among their fellow inmates and prisoner-soldiers. Ziaei has forbidden that practice. A cumulation of damning reports depict Rajai Shahr Prison as a hotbed of corruption and human rights violations. 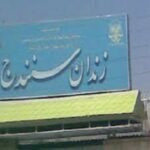 Human Rights Activists News Agency (HRANA) – A 50-year-old man died within a day of his arrival to Zahedan Central Prison on October 27th due to untreated gastrointestinal issues. 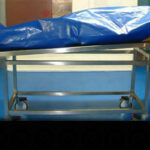 He was reportedly suffering from severe diarrhea when he was transferred from quarantine to Ward 6. He received no medical care and died later that night. HRANA is in the process of confirming the identity of this prisoner, the sixth in the past seven months to die in the custody of authorities at Zahedan Central Prison. Despite a dearth of medical staff, supplies, and equipment, Zahedan Central has been reluctant to transfer prisoners to outside hospitals, even when that transfer is a matter of life or death. Zahedan is the capital of the Southeastern province of Sistan and Baluchestan, bordering Pakistan and Afghanistan and home to the Baloch ethnic minority. Human Rights Activist News Agency (HRANA) – The condition of Evin prisoner Alireza Golipour has significantly declined over the course of his prison sentence, his lawyer Azita Gharebeygloo told HRANA. Statements from the prison’s medical team — that effective treatment will not be viable inside the prison — were confirmed by the Medical Commission’s opinion that an extra-prison medical transfer is in order, Gharebeygloo said. Less clear, however, is whether or not this urgency will resonate with the judiciary. “The commission’s report was announced to the prosecutors, but they have yet to give us any response,” she said. In an interview with HRANA this past March — when Golipour was suffering from epilepsy, heart disease, and a lymph node infection, all exacerbated by his hunger strike — his attorney was already pressing for him to receive specialized care. On March 2nd, the head of Evin’s prison clinic assessed Golipour to be in critical condition after he suffered a mild heart attack and consented to a medical transfer on the condition that it be cleared by the prison’s supervisory prosecutor. The prosecutor has yet to consent. A group of Evin prisoners later addressed a letter to prison authorities imploring them to arrange for Golipoor’s treatment. 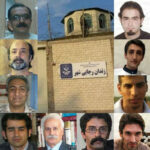 Human Rights Activists News Agency (HRANA)- The political prisoners in Zahedan prison continue to endure mistreatment at the hands of personnel, the harassment of their families by authorities, malnutrition, medical negligence, arbitrary restriction on furlough, and the temperature extremes of an overcrowded prison without climate control. Constructions and repairs on two wards have dragged on since last year and exacerbated overpopulation concerns at the prison, where many inmates spend nights on their floor. A close source said that visiting-room personnel and the supervising judge’s office are not above disparaging prisoners’ visiting kin, and cited the judge’s secretary as having particularly hostile conduct toward guests. The visiting-room personnel reportedly condone a guest-inspection protocol that is forceful and intrusive enough to have dissuaded a number of family members from returning. Dejected at the mistreatment of their family members, some prisoners suffer from mood disorders, declaring hunger strike or attempting suicide. Many inmates in the political ward are denied furlough despite being lawfully eligible to take it. Inspector Ghouchi, a prison quartermaster, reportedly uses the promise of furlough to extort desperate prisoners. As winter closes in, a lack of heating equipment has made the life unbearable for prisoners, some of whom went to lengths to purchase their own heating units — only to have them confiscated by prison authorities, who repurposed them for their own use in administrative offices. Any of Zahedan’s 3,000 inmates desiring medical care must get in line to see a generalist for the 20 minutes they swing by the prison each day. A psychiatrist visits twice monthly for an equally narrow time frame, while dentists or ophthalmologists aren’t brought in at all. A recently-released prisoner who worked at the cafeteria and prison shop told HRANA that the cafeteria staffs its kitchen with prisoners paid between 100 and 200 tomans [approximately $6 and $12 USD] per month, “resulting in very poor-quality meals.” The prison shop, stocking only laundry detergent and dishwasher liquid, offers nothing to supplement a hungry prisoner’s diet. Zahedan is the capital of the southeastern province of Sistan & Baluchistan, which borders Pakistan and is home to Iran’s Baloch minority. Human Rights Activists News Agency (HRANA)- Sanandaj Prison authorities are denying medical care to three inmates in dire need of treatment and surgery. Omid Saeed Moucheshmi, held for financial crimes, is being denied treatment for fractured left fingers. Gholamreza (aka Shouresh) Morovati has been denied transfer to the hospital for surgery since suffering an ACL rupture on July 30, 2018. Sanandaj has not transferred any of its prisoners to outside health facilities for the past month and a half. As an excuse for denying such requests, authorities are reportedly falling back on the case of a prisoner who escaped whilst being transferred to Ghods psychiatric hospital 45 days ago. Human Rights Activists News Agency (HRANA)- A request for retrial for a married couple imprisoned on political grounds has been denied for the second time by Branch 33 of Iran’s Supreme Court. Hassan Sadeghi and Fatemeh Mosana, who have been tortured and incarcerated multiple times over the past four decades since the Revolution, are currently serving 15-year prison sentences; Sadeghi in Karaj’s Rajai Shahr prison, and Mosana in Tehran’s Evin prison. After being tortured by intelligence agents during an arrest, Sadeghi sustained eye injuries that have developed into secondary ailments, including glaucoma. His glaucoma-afflicted right eye may soon require surgery, but the advancement of his disease informs a poor prognosis. Though he has made an appointment with an ophthalmologist, he won’t be able to honor it: the prosecutor’s office refuses to issue Sadeghi the permit he needs to go there. Sadeghi was first arrested in 1981 at the age of 16, and was tortured over the course of his six-year detention; the impact of multiple lashings ground a dent into his skull. Under psychological and physical duress, Sadeghi also developed an ulcer and gastrointestinal infection. Years later, gel insoles and orthopedic shoes help relieve the chronic foot pain caused by his torturers, who fractured his heel bone with repeated whips of a cable to the soles of his feet — yet the prosecutor’s office bars Sadeghi from even buying them himself. Mosana, 41, was first arrested in 1980 at the age of 13. With her mother, she was charged with “Moharebeh” [enmity against God] and “Baqi” [rebellion] for membership in the opposition group MEK. Both served three years in prison; meanwhile, three of her brothers and a sister-in-law were executed for opposition activities. Mosana suffered a leg injury while incarcerated in 2016 that required the application of a cast, a treatment that authorities delayed for two and a half months. After her complaints of chronic pain were ignored by prison staff, she was transferred to an outside medical facility where doctors diagnosed her with permanent tendon rupture. Sadeghi was again arrested along with Mosana and his two children in February 2013 for commemorating his late father, an anti-regime activist. Authorities sealed Sadeghi’s home after the arrest and detained their 10-year-old daughter Fatemeh for three days. Their son Iman, 19 years old at the time, was in custody for a month and a half. Sadeghi and Mosana spent a year behind bars before going free on bail. 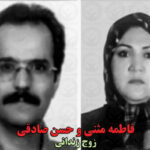 Judge Ahmadzadeh of Revolutionary Court Branch 26 would later order the couple to serve 15 years in prison and surrender their property, including their home and their shop. This sentence was later upheld in appeals court. Mosana was detained September 30, 2015, to begin serving the 15-year sentence. Her husband was arrested in turn while visiting her in Evin prison on February 7, 2016. Their children, now aged 26 and 19, are in the care of their elderly grandmother. Human Rights Activists News Agency (HRANA)- A prisoner in his eighth year of a 30-year sentence is in urgent need of medical care. Evin prisoner Motaleb Ahmadian, 31, suffers from orchitis [infection and inflammation of the testes]. The infection recently spread to his bladder, a close source revealed, adding that the diagnosis was confirmed during ultrasonography tests Ahmadian underwent while on transfer to Telaghani hospital. His illness requires treatments that would drain excess fluid from the infection sites; uncontrolled, an infection of this type could lead to cancer. He is currently on the prison doctor’s waiting list for a medical transfer to undergo surgery, which he must pay out of his own pocket at an estimated 20 million tomans [approximately $1,500 USD]. Ahmadian was convicted on multiple counts: Moharebeh [enmity against God] through membership in a Kurdish opposition group; illegal entry into the country while armed and supporting a military group; and aiding and abetting murder. The charges stem from armed clashes in Saghez in 2010 that resulted in the death of a policeman and a civilian. In August 2018, Branch 1 of Kurdistan provincial criminal court sentenced Ahmadian to eight years in prison for “aiding and abetting murder” and ordered him to pay half of the murder victims’ “blood money” [a designated sum owed to the families of homicide victims]. He was given an additional year and fined 20 million tomans [approximately $1,500] USD] on assault charges. Initially ordered to serve his sentence in exile in the southern city of Minab, he was instead transferred from Sanandaj to Tehran’s Evin Prison for reasons that were not disclosed. 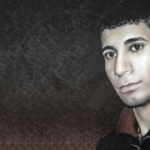 Ahmadian, a Baneh native, was originally arrested October 5, 2010, after which he spent 230 days in solitary confinement. On May 3, 201,6 he was transferred to Saghez Prison after another prisoner made statements linking him to a weapon that was found there. This charge held water for some time, despite the material implausibility of smuggling a weapon from Sanandaj, where Ahmadian was held, to Saghez, more than 120 miles away. He was eventually acquitted and transferred back to Sanandaj. Further back, Ahmadian was fined 100,000 tomans [approximately $300 USD] and sentenced to a year in prison for illegal border crossings in 2008 and 2011. Saghez, Sanandaj, and Baneh are located in the province of Kurdistan on Iran’s border with Iraq. It is home to Iran’s Kurdish minority. 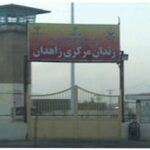 Human Rights Activists News Agency (HRANA)- On Monday, October 22, 2018, a bloody brawl that broke out in Rajai Shahr Prison led to the hospitalization of two prisoners who sustained serious injuries. The victims were identified as Amir Akbari and Moslem Karimpour, both from hall 19 of Ward 7, and both incarcerated on murder charges. Akbari suffered from massive blood loss after sustaining multiple lacerations with a sharp object and slipped into critical condition when his transfer to the hospital was delayed. Karimpour returned to Rajai Shahr on Wednesday, October 24th after getting treatment for wounds sustained his abdomen and chest. Well aware that ward transfers in Rajai Shahr — primarily a holding facility for violent crimes — have the potential to devolve into violent clashes, authorities there initiated the skirmish when they attempted to transfer Akbari to a different ward. Prison personnel, namely Gholamreza Ziaei, the Rajai Shahr director, and Vali Alimohammadi, president of the prison’s internal affairs, were met with protests from a group of prisoners when they continued to push for the transfer. Prison security has been known to fan flames of division among prison gangs by conducting its business with the help of incarcerated violent offenders. Such meddling by security personnel was reportedly a factor in Moradi’s death. A notorious point of exile for political and common criminals, Rajai Shahr’s reputation precedes it as one of the most cutthroat environments for prisoners in Iran. 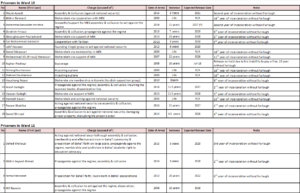 Human rights organizations have published numerous reports of Rajai Shahr managers’ misconduct, including arbitrary and inhumane punishments, participation in organized crime, mafia activity, and smuggling, and the premeditated murders of prisoners. HRANA reports indicate that Gholamreza Ziaei and Vali Alimohammadi are the most oft-cited and seasoned perpetrators of human rights violations in Rajai Shahr. Valimohammadi, who is also the Ward-4 Warden, is reportedly in cahoots with prison gangs facilitating intra-prison drug trafficking. Ziaei headed the Kahrizak camp, where several political prisoners were tortured and killed during his tenure. Karaj is located 30 miles west of Tehran and is the capital of Alborz province. Human Rights Activists News Agency (HRANA)- This past August, Rajai Shahr Prison authorities ordered the transfer of political prisoners to Ward 10, where prisoners’ already-tight rations on climate control, fresh air, and nutrition have reportedly been cut even slimmer. It is a running suspicion that prison authorities seek to dismantle the political ward, breaking down these prisoners’ spirits so that they will be more amenable to being dispersed among different wards. Ward 10 currently houses 18 prisoners charged with political and security-related crimes. Four more political prisoners are being held in lateral sections. Of these 22, seven are in need of medical care. A cold chill is already creeping through the walls of the hillside prison, boding the incoming flu season from which political prisoners stand unprotected, a close source told HRANA. “The need for heating equipment is felt all across the prison, but on [Prison Head] Gholamreza Ziayi’s orders, the political prisoners can’t have access to heaters. While prisoners pay for heaters out of their own pockets, the director has forbidden their delivery or use in the political ward.” Prison authorities have reportedly even gone as far as banning heaters in common areas that political prisoners might flock to for refuge, i.e. the prison library, gym, or store. A letter underlining the dire need for climate control addressed to Ziyai from a previous prosecution assistant responsible for overseeing prison affairs, did nothing to change his mind, the source said. Political prisoners got the brunt of the opposite heat extreme this past summer when they were denied access to any form of a cooling system. While their repeated requests managed to obtain three refrigerators for the ward, Ziyai underlined that they would have access to more equipment and amenities if they requested to be transferred to different wards. Political detainees have thus far held fast to regulations requiring prisoners charged with different offenses to be housed in separate wards. 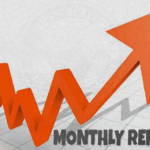 Their resistance against integrating with prisoners accused of petty theft, drug-related crimes, or violent offenses has contributed to continued daily frictions between authorities and their cohort. Meanwhile, the assessment of food provided to these political prisoners is even more scathing than the Rajai Shahr usual. Sources say that prisoners eat vegetarian by default, limited to plain rice with soy or lentils at lunchtime. Though the dinner menu promises to be more substantial — bean or lentil stew, or Ash [a thick Iranian soup] — sources say that the dishes hardly live up to their names, and prisoners in the cohort are rarely, if ever, served produce. Deprivation of fresh air is also being leveraged against them, sources say. 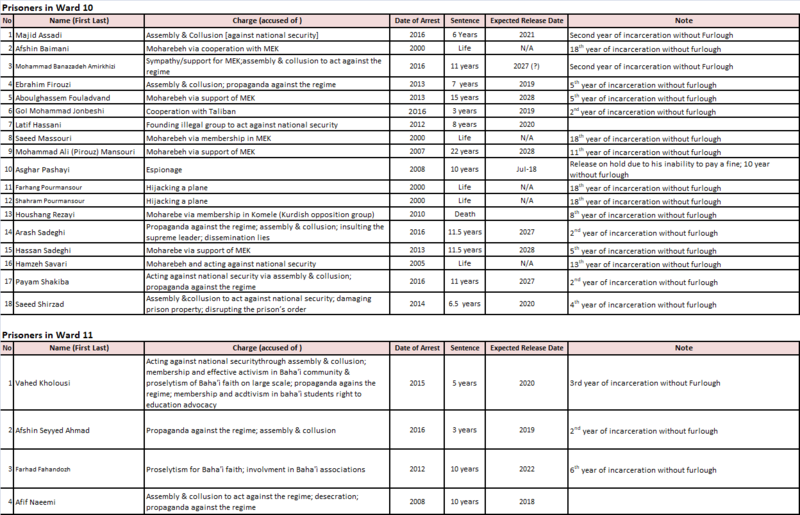 The regular 2-to-5:30 recreation period previously enjoyed by political prisoners in mixed groups has been eliminated entirely since their transfer to Ward 10. “Fresh airtime has been denied [to them] on direct orders from Ziayi, despite the fact that the recreation area is empty between 10 a.m. and 2 p.m.”, an anonymous source said. Though seasoned in-group attrition tactics, authorities at Rajai Shahr have not shied away from more targeted brutality to get their point across. Multiple sources have reported aggressive body searches, harassment and verbal abuse of prisoners’ families, and the placement of arbitrary, extreme restrictions to wear down individual inmates. In one such instance, Supervising Prosecution Assistant Rostami placed a long-term prohibition on visits between Hassan Sadeghi and his imprisoned wife; in another, medical attention to the bone cancer and infected surgery site of Arash Sadeghi were repeatedly postponed and denied. 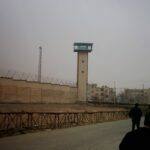 Deprivations like Sadeghi’s may become more widespread: two weeks ago, an official prison order came into effect, invalidating all approved transfers of ailing prisoners to [outside] medical facilities. 1. 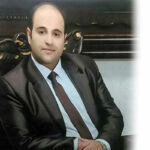 Majid Assadi, accused of assembly and collusion [against national security]. Arrested in 2016, sentenced to 6 years. Anticipated release date: 2021. Has been incarcerated for two years without furlough. 2. Afshin Baimani, accused of Moharebeh [enmity against God] through cooperation with the MEK. Arrested in 2000, sentenced to life. Currently in 18th year of incarceration without furlough. 3. Mohammad Banazadeh Amirkhizi, accused of being a MEK sympathizer, and of assembly and collusion against the regime. Arrested on 2016, sentenced to 11 years. Anticipated release date: 2027. Has been incarcerated for two years without furlough. 4. Ebrahim Firouzi, accused of assembly and collusion and propaganda against the regime. Arrested in 2013, sentenced to 7 years. Anticipated release date: 2019. Currently in 5th year of incarceration without furlough. 5. Abolghassem Fouladvand, accused of Moharebeh through supporting the MEK. Arrested in 2013, sentenced to 15 years. Anticipated release date: 2028. Currently in 5th year of incarceration without furlough. 6. Gol Mohammad Jonbeshi, accused of cooperation with the Taliban. Arrested in 2016, sentenced to 3 years. Anticipated release date: 2019. Currently in 2nd year of incarceration without furlough. 7. Latif Hassani, accused of forming an illegal group to act against national security. Arrested in 2012, sentenced to 8 years. Anticipated release date: 2020. 8. Saeed Massouri, accused of Moharebeh through membership in the MEK. Arrested in 2000, sentenced to life. Currently in 2nd year of incarceration without furlough. 9. Mohammad Ali (Pirouz) Mansouri, accused of Moharebeh through support of the MEK. Arrested on 2007, sentenced to 22 years. Anticipated release date: 2028. Currently in 11th year of incarceration without furlough. 10. Asghar Pashayi, accused of espionage. Arrested in 2008, sentenced to 10 years. Anticipated release date: 2018. Release pending his payment of a fine. Currently in 10th year of incarceration without furlough. 11. Farhang Pourmansouri, accused of hijacking a plane. Arrested in 2000, sentenced to life. Currently in 18th year of incarceration without furlough. 12. Shahram Pourmansouri, accused of hijacking a plane. Arrested in 2000, sentenced to life. Currently in 18th year of incarceration without furlough. 13. Houshang Rezaei, accused of Moharabeh through membership in Komele [Kurdish opposition group]. Arrested in 2010, sentenced to death. Currently in 8th year of incarceration without furlough. 14. Arash Sadeghi, accused of propaganda against the regime, assembly and collusion, insulting the supreme leader, and disseminating lies. Arrested in 2016, sentenced to 11.5 years. Anticipated release date: 2027. Currently in 2nd year of incarceration without furlough. 15. Hassan Sadeghi, accused of Moharebeh through cooperation with the MEK. Arrested in 2013, sentenced to 11.5 years. Anticipated release date: 2028. Currently in 5th year of incarceration without furlough. 16. Hamzeh Savari, accused of moharebeh and acting against national security. Arrested in 2005, sentenced to life. Currently in 13th year of incarceration without furlough. 17. Payam Shakiba, accused of assembly and collusion against national security and propaganda against the regime. Arrested in 2016, sentenced to 11 years. Anticipated release date: 2027. Currently in 2nd year of incarceration without furlough. 18. Saeed Shirzad, accused of assembly and collusion against national security, damaging prison property, and disrupting prison order. Arrested in 2014, sentenced to 6.5 years. Anticipated release date: 2020. Currently in 4th year of incarceration without furlough. 1. Vahed Kholousi, accused of assembly and collusion against national security, Baha’i membership, activism, and proselytizing, propaganda against the regime, and activism in defense of Baha’i student rights. Arrested in 2015, sentenced to 5 years. Anticipated release date: 2020. Currently in 3rd year of incarceration without furlough. 2. Afshin Seyyed Ahmad, accused of assembly and collusion and propaganda against the regime. Arrested in 2016, sentenced to 3 years. Anticipated release date: 2019. Currently in 2nd year of incarceration without furlough. 3. Farhad Fahandoj, accused of Baha’i proselytizing and involvement in Baha’i associations. Arrested in 2012, sentenced to 10 years. Anticipated release date: 2022. Currently in 6th year of incarceration without furlough. 4. Afif Naimi, accused of assembly and collusion, blasphemy, and propaganda against the regime. Arrested in 2008, sentenced to 10 years. Anticipated release date: 2018.